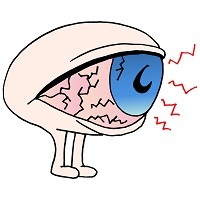 Does Dry Eye Disease Hinder Sleep Quality and Mood? Sleep quality and subsequent mood have long, and logically, been correlated. Now, researchers from Japan sought to see how a third consideration, ocular function, fits into that equation. In an effort to determine how dry eye disease (DED) can impact sleep quality and overall mood, the researchers recently compared about 100 women who suffer from the condition with 100 who did not. Their results were presented by Masahiko Ayaki, MD, at the American Academy of Ophthalmology’s 2016 Annual Meeting this week in Chicago. The two cohorts were split into three age subgroups each: 30 to 45, 46 to 55, and 56 to 69 years old. Ocular metrics, like Schirmer test scores, which determine tear production, were stacked against sleep metrics like the Pittsburgh Sleep Quality Index (PSQI), a standard questionnaire. Mood was judged based on the Hospital Anxiety and Depression Scale (HADS). The study found that ocular signs were consistent across the age groups. HADS scores were worse in the younger DED group than their equivalent controls, but little disparity was found between the older women who did and did not have the condition. PSQI scores were lower in the DED group than the control, leading the researchers to conclude that DED had a noticeable impact on sleep quality and a correlation with mood.